To begin with, AOL Mail is a free web-supported email service offered by AOL. Now AOL is a subsidiary of Verizon Communications. AOL Mail is dubbed as AIM Mail. Here "AIM" stands for AOL Instant Messenger. But nowadays, users are facing issue while using the AOL Mail. They complain about AOL Mail not working on iPhone XR/XS/X/8/7/6s/6/5s/5. Well, we are here with the intention of helping you get out of this dilemma. Users are complaining about this issue or a one similar to this. Some claim that they are unable to login into their account. On the other hand, some of them say that they can just see the loading screen. Others claim that they are not even able to load the login page. Well, let us quickly begin with our list of solutions that will assist you in solving "AOL Mail not showing up on iPhone" issue. If you are facing AOL Mail down issue, then obviously there are high chances of having a problem at your end. Since the AOL service works on Internet, it is possible that your Internet is not working properly. In order to make sure your Internet is working properly, carry out the below steps. Step 1: Turn on and off the Airplane mode on your iPhone. This can be done by control panel. All you need to do is swipe up on the screen to open the control panel. Now select the option of Airplane mode. After couple of minutes, turn off the Airplane mode. Step 2: Check if you have strong Wi-Fi. If you are connected to the Wi-Fi make sure it is working fine. Step 3: If you are using cellular data, make sure you have an active data pack. This might help you solve AOL email problems. If all the above checks are performed and still you are grasped with "why is AOL Mail not working on iPhone?" 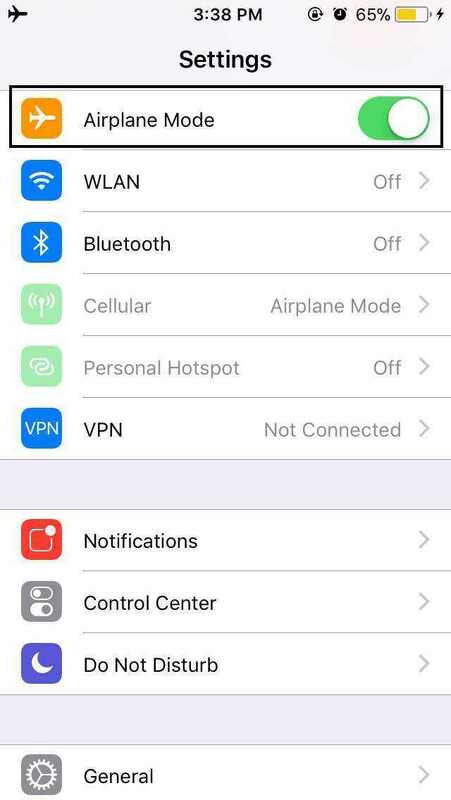 question, then it is time to rest the network settings of your iPhone. This might have a better impact then playing with Airplane mode. Follow the steps given below to solve the issue. Step 1: Go to Settings and click General. Look for Reset option. Step 2: In the Reset option look for Reset Network Settings and click on it. This also resets Wi-Fi passwords and networks, VPN and APN settings, and cellular settings. 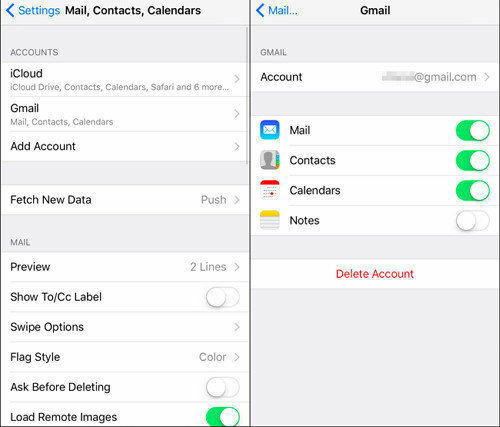 If you are still facing the "AOL Mail not sending on iPhone" issue, you must try removing the account and adding it again. Here are the steps you need to follow. Step 1: On your iPhone, head to settings. Now look for Accounts & Passwords option. Step 2: Once you locate the Accounts & Passwords option, click it. You will see a list of accounts that you have signed in on your iPhone. Click on the AOL account. Step 3: Now, as soon as you click on the AOL account, you will enter in a new page. Click on the Delete Account option present at the bottom. Sometimes, it is the software glitch that causes AOL Mail not working on iPhone. In such cases, you can always turn up to Tenorshare ReiBoot - best iPhone system recovery. This tool offers one time solution to all your issues related to iPhone. In addition to this, the tool is very simple to use. Hence, users always prefer to use this tool. Install this program on your computer, and connect your iPhone to comoputer. Choose "Repair Operating System" on the main interface. On the screen, you'll see that this iPhone recovery software is able to fix iPhone stuck on Apple logo, iPhone recovery mode loop, and other problems. Prior repairing system, you'll need to download the latest iOS firwmare package. Wait for the program to repair iOS with the firwmare package. The whole process takes a few minutes and your device will restart after system recovery. This is the ultimate solution to fix iOS related problems. In the end, if you are not able to solve the issue by using the above methods, then it is better to contact the developer for help. This can be done by visiting the help page of the app. Look for your issue in the list predefined issues that are present on the page. These issues are already provided with a solution. If your issue is not present in the list, then you can always write to the developers. They will definitely reply you with a solution, thus solving your issue.